Distraction from her heartache comes in the form of her parents’ neighbour. Whispers about “odd Owen Campbell” abound in their small community, and Sarah’s curiosity is aroused. When she breaks the rules and trespasses onto his land, what she finds is beyond her wildest imaginings. 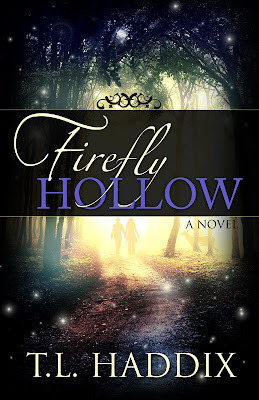 I'm not sure why but when I picked up Firefly Hollow I was expecting to read a contemporary romance so I was quite surprised to find that it was set in the 1950s - 1960s and also contained characters who were shapeshifters. That isn't a complaint, I'm just mentioning it so that people know what they're getting when they pick up the story. As much as I'd classify this as paranormal romance because of the shapeshifters it actually reads more like one of those historical sagas that follows a family for several generations which was something I really liked about it. The story has a lazy feel to it, it kind of meanders through the lives of the main characters and allows us to really get to know them both as we see them in their best and worst moments. It also places a lot of focus on the rural setting and I felt it captured the innocence of the time period really well. I think because of the way it is written it will appeal not just to paranormal fans but also to lovers of historical or contemporary romance. Owen has spent years isolating himself from the community, he doesn't believe that he is worthy of love or that anyone would be able to accept him for who he really is so he pushes the outside world away and remains secluded on his family's land. I really loved Owen, he was so sweet and protective, not just of Sarah but also towards his family, and he knows how to write the most beautiful love letters! He is a shy man but when you break through his shell you'll find someone who is kind, polite and who has a lot of love to share. There was a certain point in the story where I was annoyed at the way he treated Sarah, not because he was mean to her but because he didn't think about how things would look from her point of view and I was disappointed that she was such a low priority for him at that moment. I could understand how it happened but it did upset me a bit so I was pleased that when he realised his mistake he was man enough to admit it and to go out of his way to make things up to her. I found Sarah a really likeable heroine, she was smart and funny and she was determined to live life on her own terms. She didn't want a man to look after her, she preferred to earn her own money and be able to stand on her own two feet. I liked the fact that she was so intelligent and that she wanted to learn and grow. I also enjoyed the relationship she had with her mother and some of the conversations the two of them had were hilarious. One thing I really appreciated was that even though she didn't get on particularly well with her sister Kathy they still stuck by each other when they really needed help. There was a point where my heart absolutely broke for the whole family and I'm still shocked with the way certain events played out. Another thing I really enjoyed though was Sarah's friendship with Gilly and the side romance between Gilly and Jack. As much as I enjoyed the slow pace of the book there were times when I found myself starting to get a little bored at the lack of action, the writing is beautifully descriptive but I did feel it could have been trimmed back a bit to make the story just a little faster paced. At times it felt that obstacles were being deliberately thrown in between Sarah and Owen and I'd have liked things to be a little easier on them. I still enjoyed the story and will definitely be continuing the series in the future though. Firefly Hollow isn't your standard paranormal romance, the paranormal side of the story is subtle and this book is much more focused on the lives of Sarah and Owen and the love that slowly develops between them.